Rennes' coach Rolland Courbis looks on before the Ligue 1 match between Rennesvand Ajaccio at the Roazhon Park in Rennes, northwestern France. 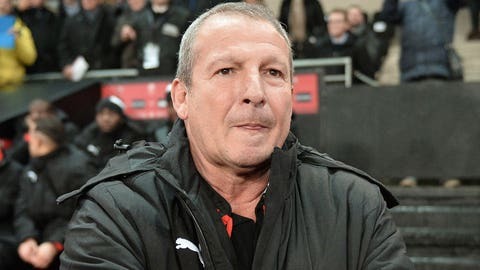 Rolland Courbis made a dream start to life in charge of Rennes as their winless home run finally came to an end against in-form Gazelec Ajaccio. Former Montpellier boss Courbis succeeded Philippe Montanier on Wednesday, a week after joining the club as advisor to president Renee Ruello. Rennes had gone 10 matches without a victory at Roazhon Park and looked like making that 11 with the clash goalless heading into injury time. But Roderic Filippi put through his own net to hand the hosts a 1-0 victory and lift them up to third in the Ligue 1 table while bringing an end to Gazelec’s 14-match unbeaten run.